The Pella Municipal Airport is located one mile from Pella’s central business district. The general aviation airport has been at its current site since 1967. No airline services are offered at this airport. 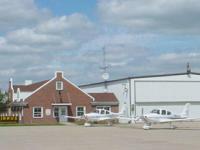 The airport's fixed based operator (FBO) is Classic Aviation Inc., which is contracted by the City of Pella to maintain and operate the airport. Classic Aviation has been the FBO at the Pella Municipal Airport since 1988 and provides aircraft fueling and service, aircraft maintenance, flight instruction, aircraft rental, and professional pilot service. Each year, the Pella Municipal airport holds a flight breakfast / airport open house on the Saturday of the Pella Tulip Festival, which is during the first week of May. For information on runway lengths, instrument approach procedures, and services available, visit AirNav.com. Information can also be obtained by contacting Classic Aviation at 641.628.9393. For information on the Airport Committee, contact Public Works Director Denny Buyert by calling 641.628.1601.